Unlike almost any other Florida university, UNF does not have a football team. To some this may seem like a major disappointment; however, to most Ospreys, it is not the focus of our athletic program. Basketball, tennis, golf, cross country and beach volleyball are just a few of the sports that UNF focuses on. UNF Ospreys compete in the Atlantic Sun Conference Division I program and fields teams in seven men’s sports and ten women’s sports. For students at UNF, there is no charge for any sporting event. Students can watch an exciting game of men or women’s basketball in the UNF Arena, baseball or softball at the Harmon Stadium. Most ticketed games, such as men’s and women’s basketball, a student needs to print a ticket and have their student id. Click here to ticketing information including dates, cost, and seating in the Arena. School spirit is high at UNF. One of the intramural athletic programs that UNF offers is Osprey Nation. 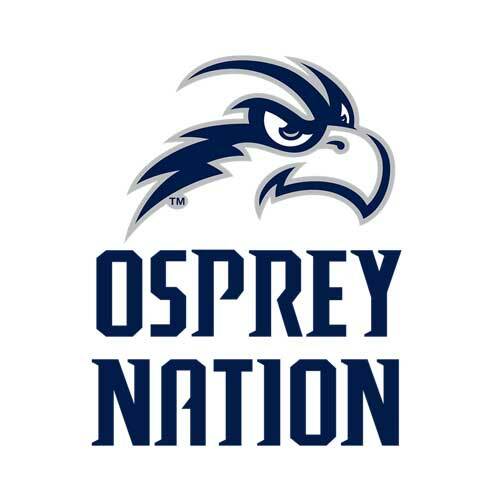 Osprey Nation is the current student body at the University of North Florida, collectively participating in on-campus activities and athletic events. To access more athletic related experiences students can become an Osprey Nation VIP member for just $10 a year to gain more connections with athletic teams, coaches, and enhance their relationship with college athletics. Some of the goals of Osprey Nation are increased student-spirit on campus, throughout the community, and at all athletic events. And to create an exciting atmosphere and provide North Florida student-athletes with a home court/ field advantage that is unrivaled by any other ASUN Conference school. A really cool season-long event is called River City Rumble. The River City Rumble is a season-long series between Jacksonville’s two Division I institutions – UNF and Jacksonville University. River City Rumble was started in 2006. UNF and JU battle annually for the “Old Wooden Barrel,” which is awarded to the school with the most victories in head-to-head competition over the other during a school year. Each time the Ospreys and JU Dolphins face each other, the game will count toward the River City Rumble standings. The two teams annually square off against each other 22 times. The school with the most wins will receive the “Old Wooden Barrel” at the end of the year. River City Rumble is a great way for two schools to have some rivalry fun!